Dark ceilings are dramatic! 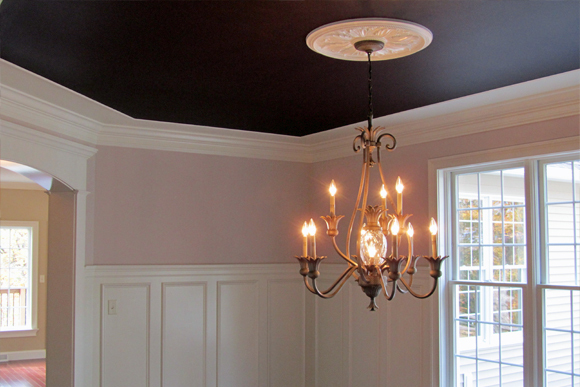 We painted the dining room ceiling of this recently completed custom home a deep eggplant purple, Benjamin Moore AF-650 caponata. Common wisdom (which often isn’t very wise) says that dark colors shrink a room. In this case the effect was to make the 9′ ceiling feel taller. When I joined the family construction business in 1987 designers were in the middle of an off white craze. I am glad to see the return of colors over the past few years and people’s growing willingness to play with deep, rich, unique colors. 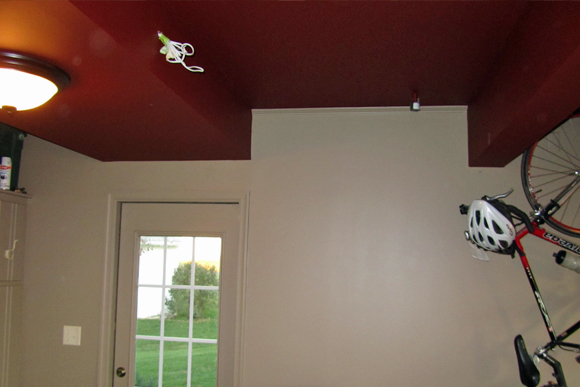 This garage ceiling is painted a deep red color, Benjamin Moore, Arroyo Red. 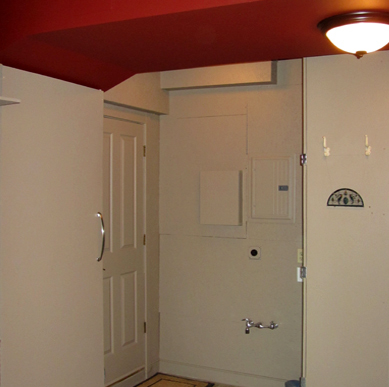 The doors, cabinets, walls, and everything on them are painted a single color to give a less cluttered look. Benjamin Moore HC-77 Alexandria Beige. 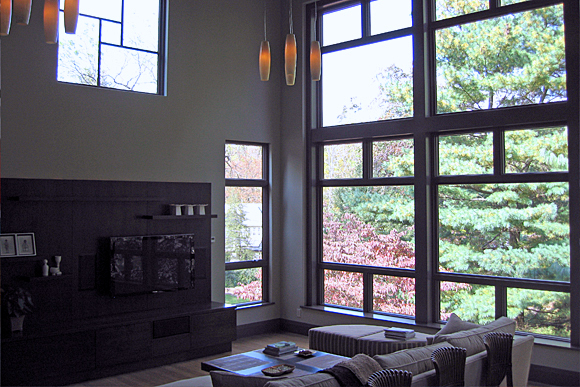 We painted the ceiling of this dramatic contemporary family room a bronze that was custom matched to the Terratone color of the Anderson windows. 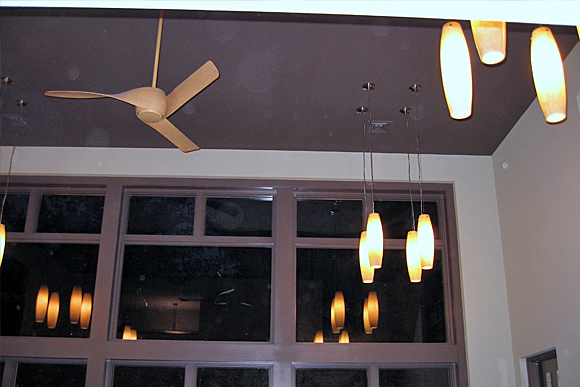 At 18′ this ceiling did not feel any higher with the dark paint. 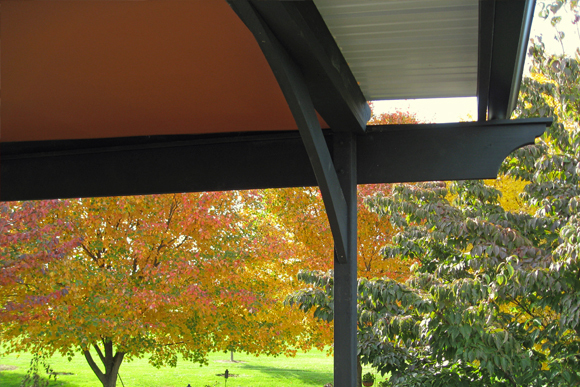 To add some fun to this back porch ceiling I picked a terracotta to tie into nature and painted all the supporting structure black to add some drama. On the traditional gray clapboard house the colored porch ceiling is a pleasant surprise when you walk out the back door. Benjamin Moore Georgian Brick HC-50. To help our customers see colors accurately we make large samples of any deep or unique colors we select, sometimes as large as 36″ x 36″. A pint of paint is cheap compared to repainting a room. Go, Paint Your Ceiling Boldly! This entry was posted in Details and tagged color, Design Concepts, Details, Lancaster, New Holland. Bookmark the permalink. 1 Response to Dark ceilings are dramatic!